Eltronicschool. - This is one of the best project for you who want to develop your ability in Arduino programming and design in this time. 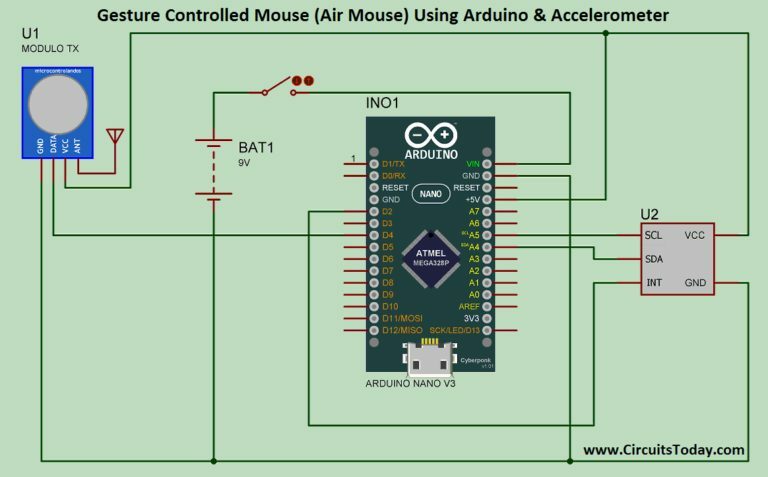 This article will discuss to you about Arduino Nano and accelerometer for gesture controlled mouse. Beside we will give you the circuit schematic of gesture controlled mouse using Arduino Nano and also the simple description of this project, and the last we will give you the link to read more about this project from original source. Circuit schematic like in Figure 1 above is Gesture Controlled Mouse Using Arduino Nano and Accelerometer. AIR Mouse is also called gesture-controlled mouse and it works based on hand gesture. In this project an accelerometer is used for measuring the tilt of hand in X and Y direction and moves the cursor according the tilt. In the project two types of circuit are used, one is the transmitter circuit and other is the receiver circuit. Transmitter circuit makes use of MPU6050 series of accelerometer, which is connected to Arduino through I2C communication. The data is transferred to receiver Circuit using RF module, ASK433. Two switches are also used in transmitter circuit to work as Left Click and Right Click. In the receiver side an Arduino Leonardo is used. The purpose of using Arduino Leonardo is that it supports HID (Human Interface Device). HID allows us to control the mouse and Keyboard of our PC or Laptop. 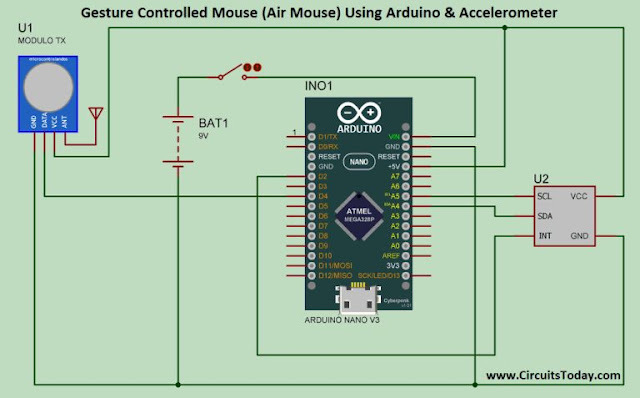 And now you can read more about this article Gesture Controlled Mouse Using Arduino Nano and Accelerometer from original source using link HERE.